Co-ownership issues arise when a veterinarian becomes partners with other owners, or when two or more associates join to buy a veterinary practice. Becoming a co-owner of a veterinary practice is like getting married. It’s important to agree on the principal terms governing the relationship before getting hitched. What basic form should the practice take? A “C” corporation, an S corporation, limited liability company (LLC), partnership (general or limited), or sole proprietorship? When buying less than all of a practice, the buyer usually must accept the existing structure. Even when buying 100% of already existing entity, adverse tax consequences often preclude transforming that entity. Those purchasing assets or starting from scratch have greater latitude. Selecting the right entity is a complex decision that should be thoroughly explored with the owners’ accountant and attorney. Generally, tax considerations are determinative, but liability is also an important aspect. For example, while general partnerships often permit added flexibility, each partner is responsible for his share of the losses run up by the other partners (i.e., joint and several liability). Thus, if a partner incurs malpractice losses exceeding the practice’s insurance coverage, the other partners will be responsible for the shortfall. a. How will owners be paid for their efforts as veterinarians? Will their compensation be based on their individual gross revenues, on practice gross revenues, or will they be paid a flat salary? Or should it be a combination of the foregoing? Note that owners are almost always also employees of the practice to take advantage of various tax advantaged employee benefit plans. b. How will the practice’s profits be shared? Should each owner’s “take” be based on his ownership interest in the practice, his relative contribution to the practice’s gross revenues, his ability to bring in knew clients (i.e., “rainmaking”), or other factors? Some business entities, such as partnerships, allow more flexibility than others in distributing profits. Beware of the double taxation consequences of distributing dividends from a “C” Corporation. “S” corporations are less flexible because the profits are distributed in proportion to ownership interest. a. Governance of the selected practice entity are addressed in its constituent documents or more frequently in an a shareholders’ agreement (partnership agreements for partnerships, operating agreements for LLCs). When two equal co-owners join, typically all decisions will require unanimity, subject to perhaps dividing the day to day management duties among themselves. Three or more owners, particularly if they don’t have equal shares in the practice usually require more complicated schemes. For example, majority vote needed for all decisions, other than certain enumerated strategic matters such as the acceptance of a new partner, or approving capital expenditures over a certain threshold, which require a super majority vote (e.g., 66.66%) or even unanimity. b. Will the owners do the day-to-day managing themselves or hire a practice manager? Co-owners should consider their respective roles in this area and how their efforts should be compensated since they may be foregoing income generated from practicing veterinary medicine if their compensation is based on revenues. 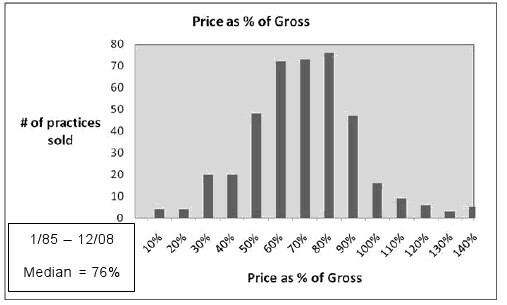 Compensation for management duties usually ranges between 2 and 4 percent of the annual gross revenues of the practice. 4. Transfers, Withdrawals and Buy-Outs. a. Because it is unthinkable to let strangers into the practice without the approval of all the owners, the shareholders’ or operating agreement usually prohibits an owner from selling his interest to a third party…without at least first offering it to his partners. b. What happens when an owner dies, is disabled, goes bankrupt, gets his license revoked or just wants to retire? Or what happens to an owner who divorces and the divorce settlement awards an interest in the practice to the spouse? In all of these cases, the owners typically have either the option or obligation to buy-out the affected owner at a price based on the practice’s appraised value. (In many agreements, the practice entity instead of the owners may purchase the affected owner’s interest.) In the case of death and/or disability, some owners subscribe to life and/or “buy-out” disability insurance policies, the proceeds of which are used to fund the purchase. c. Owners selling a portion of their interest in the practice in anticipation of retirement sometimes wish to penalize their the junior partners for withdrawing from the business before they have sold their remaining interest in the practice (i.e., “you should not get out before I do”). These penalties usually reduce the price the junior partner can get for selling his interest. A clause prohibiting the owners from directly or indirectly competing with the practice, keeps the owners focused, preserves the goodwill of the practice and reduces conflicts of interests. Veterinarians seldom have time to do anything else than practice their profession. Nevertheless, it is far preferable to resolve co-ownership issues at an early stage rather than to wait until a dispute arises. Denial and misunderstanding are the handmaidens of messy divorces. ii While we consider a two partner practice; the basic issues are the same no matter how many partners there are. Their resolution just gets more complicated. Will your heirs receive a fair price, or any price for your investment in the practice? Will they remain locked into that investment forever? Will your heirs collect profits from the practice? What if the other partner (who is getting paid under his practice employment contract) has voting control and decides not to distribute profits? 2. What happens when your partner dies? Your deceased partner’s heirs are now your new partners. Barring a fluke, your new partners will not be veterinarians. Does your State permit non-veterinarian practice owners? Will they want to be bought out or stay and collect profits from the practice? (Without contributing to profit generation of course.) If the deceased partner was a large shareholder, or the majority interest holder, the heirs will also inherit your deceased partner’s voting rights. Do you want to share practice management with, or be managed by, such persons? What if the heirs squabble among themselves, leading to management paralysis and/or litigation? Do you fancy having the practice run by a court-appointed receiver? If the heirs are to be bought out, who determines the purchase price? How and by whom is it paid? If there’s a note, is it secured? How? 3. What if you are permanently disabled? Will you receive a fair price, or any price for your investment in the practice? Will you remain locked into your investment forever? Will you collect profits from the practice? What if the remaining partner decides not to distribute profits? If you are to be bought out, who sets the purchase price? By whom and how is it paid? If there’s a note, is it secured? How? 4. What if your partner is permanently disabled? Will your disabled partner want to be bought out or stay and collect practice profits (without generating any of same)? A disabled partner’s interests will be different then yours, so if he was the managing and/or majority partner, how will he run the practice? Will he be able to run the practice? What if the disabled partner is mentally disabled? 5. What if your partner goes nuts? you, controls the practice entity. The same problem arises for equal partners. Sure your mentally disabled partner could voluntarily remove himself, but can you rely on that? What if the majority partner has a guardian? How will the guardian run the practice? What if the majority partner or guardian fires you? 6. What if your partner should be fired as veterinarian-employee? Suppose your partner becomes lazy or his child becomes ill and decides to work significantly less hours or stop working altogether. Suppose your partner becomes a substance abuser and consequently unfit to practice veterinary medicine. Or he steals from the practice. Or he harasses employees and/or abuses clients and/or patients. The foregoing would be grounds for terminating a veterinarian employee. But if your partner is the majority or an equal partner you can’t fire him (as explained in the preceding paragraph). 7. What if you no longer get along? Should the practice be dissolved? If not, who should leave? At what price should the departing partner be bought out? How and by whom is it paid? If there’s a note, is it secured? How? 8. In a 50/50 practice how are disagreements handled? What happens when each party has equal voting/management rights and a serious disagreement arises? How will the resulting deadlock be resolved? 9. What if your partner wants to drop out, buy a boat and sail around the world? Should your partner be permitted to withdraw? If not, how do you keep your partner from just resigning as an employee (in light of the constitutional prohibition of involuntary servitude)? If so, should withdrawal be subject to your partner reaching a certain age (e.g., 55 or 60)? What if your ex-partner discovers he’s chronically sea-sick and comes back to set up a veterinary practice next store (using the client list he kept when he left)? If a partner is permitted to withdraw, who determines the purchase price? By whom and how is it paid? If there’s a note, is it secured? How? 10. What if your partner divorces? If the divorced spouse has, or is awarded, a portion of your partner’s practice equity interest, the divorced spouse becomes a partner. Ménages à trois make great literature and film themes but ALWAYS end badly. 11. What if your partner goes bankrupt? Do you fancy your partner’s creditor as your new partner? It won’t be fun to have a bank running, or having a say in running, the practice. Worse, the bank likely will want to sell your partner’s share to a competitor. 12. Who’s got the land? The small animal practice’s most valuable asset is its location, because most clients won’t travel far for pet treatment. As zoning restrictions get ever tighter, good practice locations become ever rarer (and more expensive). If, as is frequently the case, one partner owns the practice premises, what happens when he dies, is disabled, withdraws, resigns, divorces and/or goes bankrupt? 13. What if another veterinarian wants to buy your partner’s interest in the practice? Should your partner be allowed to sell without your approval? Should you have a right of first offer? A right of first refusal? 14. If your partner is not your retirement plan, then who is? If you don’t have a firm agreement with your partner to sell your practice interest to him (or someone else) upon your retirement, then how are you going to retire using your investment in the practice as your nest egg? What if both partners want to retire at the same time?